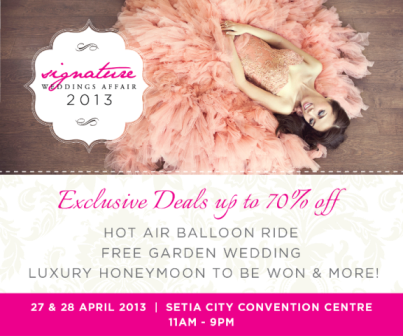 Dedicated to Signature Weddings online and magazine readers, but open to the general public, the Signature Weddings Affair which will be held at the recently opened Setia City Convention Centre in Setia Alam from 27th to 28th April. The largest proportion of visitors is expected to be sophisticated about-to-be married Malaysian demographic. The Signature Weddings Affair was conceptualized when the team at Signature Weddings realized that there was too large a gap between the information seeking, vendor contact and actual purchase stages when engaged couples were planning for their wedding. Because of this, the idea to bring together creative, high-quality and renowned vendors was born and has culminated in the Signature Weddings Affair. Where couple will get to redeem cool gifts and experiences upon booking with the wedding vendors at the event.